Say what you will about Kanye and the artist that he's become, but he's had a huge influence (for better or worse) on nearly every artist coming up in the game today. One of those artists happens to be Bay Area emcee Dahlak, a member of the iLL-Literacy crew, and a very talented artist. Not many people have heard of this talented emcee, who's 2007 Dual Conscious was a very impressive solo debut. 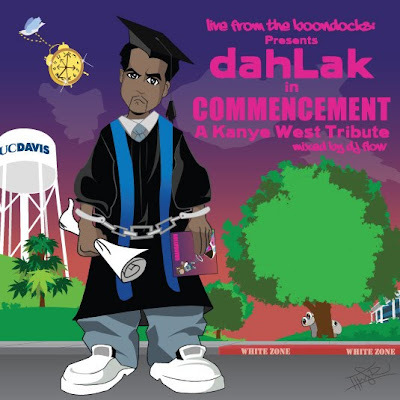 These two songs come off of his 2008 remixtape of several Kanye songs Live From the Boondocks: Commencement, which I highly recommend downloading below (Dahlak is a much more talented lyricist than West, and this is one of my favorite mixtapes of all time and nearly every track is a cut. Zion I and Geologic of Blue Scholars manage to drop by for to co-sign it). Enjoy. They like, "D, whatcha gonna be with your major?" Nothing mothafucka I'm just gonna be major. Update: Uploaded the entire mixtape via Audiomack.